Housed in one of the charming ancient British army barracks of Dempsey Hill, Shang Antique is a well known antique shop in Singapore, specializing in genuine South East Asian antiques and boasting a high-quality reputation since 1984. In its 6,000 square feet store, which runs the full width of the building, Shang Antique offers a large variety of antiques, reproductions and some furniture to choose from. 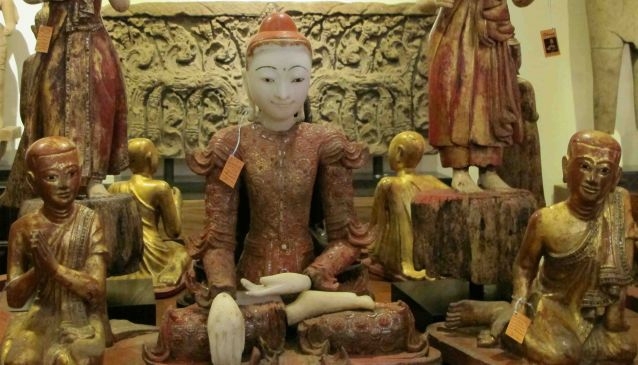 The splendid authentic antiques, distinguishable by an orange price tag, are sourced from Cambodia, Vietnam, Laos, Thailand, India, Burma, Gandhara and date from the 7th to the 19th century. This includes precious finds such as lintels and torsos as well as statues of Ganesh, disciples and Buddha often available in lacquer wood, sandstone and alabaster. These items will be packed professionally so it is easy and safe to hand-carry for those visiting from overseas. On the shop side facing the small fountain of Dempsey hill, there are beautiful items such as teak root horse sculptures and stone statues that will add a special touch of Asia to your garden or terrace. Shang Antique also sells a whole range of black resin wicker outdoor furniture: lounge and hanging chairs, daybeds and several types of dining, sofa, patio and bar sets, which will turn your al fresco into a resort style secluded place. At Shang Antique, you'll certainly find the perfect accent piece to magnify and beautify your home.